With these wonderful picture books you can! When Grandma leaves for the day, she warns Granddad not to make a fuss for her birthday. But as soon as she leaves, Granddad gets to work making the biggest chocolate cake ever. 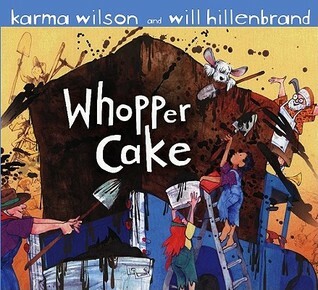 Like Granddad says, ” If I can’t make a WHOPPER cake, I’ll bake no cake at all!” He starts by mixing the ingredients in a super large bowl with a drill paddle and shovel, and ends up mixing everything in the bed of his pick-up truck with an oar from his fishing boat. As he drives the truck into town to pick up some ice cream, the sun heats and bakes the cake, raising it high above the bed of the truck. When folks got a whiff of the ‘chocolate-scented cloud’ coming from his truck, a crowd followed him home. Everyone pitched in decorating the cake with chocolate frosting. And when Grandma got home, they all yelled ‘SURPRISE!’ Grandma had only one wish as she blew out the candles, that Granddad clean up his mess. Ruby asks her friends how to bake a cake. Each one gives her a suggestion and she invites them all to her house when the cake is finished. But when everyone gets there and Ruby takes the cake out of the oven, she is embarrassed by how bad it looks. Her friends taste the cake and declare how much they like the size, shape, color, crunchiness, and juiciness. Nobody says that it tastes good though. Ruby knows her cake does not taste good, but she also knows she has very good friends. 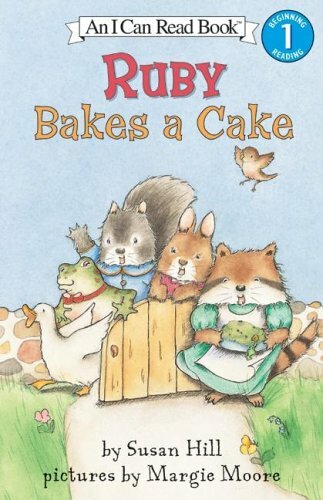 If you have a favorite picture book character, I’m almost certain he/she has baked a cake. Look at some of these titles and look for some of your own.